Four meters tall, five meters long, weighing up to two tonnes, aggressive and frighteningly smart, the Ursu is easily the largest and most feared predator in much of northern Aeldos. Increasingly rare due to competing predators, the species survives on a steady diet of ungulates such as Elk, Daedon, and Rhinock supplemented by large fish and the occasional unwary hunting party or caravan. Ursu roars send a panic through communities; more than one settlement has been destroyed by a hungry Ursu and even larger cities tend to go into high-alert when their presence is detected. Ursu coloration varies from brown to black. They have small feral eyes with a red sheen and their fur is often matted with blood. Ursu teeth are the size of daggers and many Ursu have been found to possess bony, armour-like protrusions on the shoulders, spine and chest, making them even deadlier. Despite its enormity the Urus can reach terrifying speeds while running and has been known to pursue potential prey for days. It is unclear how long Ursu can live but some evidence points to centuries; accounts of dead Ursu bearing wounds from ancient weapons or the spearheads of the ancestral hunters are frequently cited. – They are solitary animals, only found in pairs when breeding (a blessedly rare act). – They are known to enter hibernation for long periods, but are adept at choosing remote and difficult to access lairs for such hibernation. – They are highly territorial and will hunt or chase any other predator in their territory. – A single swipe from an Ursu can kill a fully armoured human. – They can devour a human in a few bites. – Their roar is literally deafening and sends even trained soldiers into fearful panic. – Ursu use their environment against enemies and will dig pits, fell trees or trigger avalanches to trap prey. 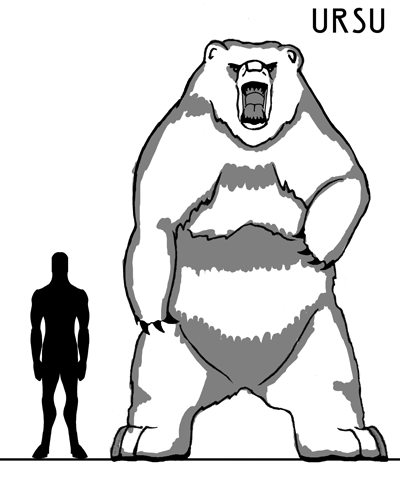 – With the exception of other Ursu, the species perceives all other creatures as prey, including other bears or bear relatives such as Arctos, Clanbars and Bears. Despite the incredible danger they pose the prestige of harvesting an Ursu has driven many hunters to pursue them. Indeed, Ursu pelts and parts are considered high status items, often found in the houses of the rich or truly dangerous. While such hunts end in the deaths of the hunter more frequently than the Ursu, it remains a common aspiration of foolish or ambitious huntsmen across Aeldos.